Despite the resounding defeat of the Bloc Québécois during Canada's most recent federal election, one cabinet minister who lost his seat in a Quebec riding warned of a strong sovereignty sentiment in Quebec. Not long after the federal election, younger members of Quebec's sovereignty movement sponsored a pro-independence rally in Montreal. Several years ago, a strong pro-independence sentiment prevailed across parts of Western Canada. The high-handed behaviour of the Canadian Wheat Board, a federal agency, was identified as being a contributing factor. The impending closure of the Wheat Board and its replacement by private marketing agencies resolves a longstanding, politically contentious issue. Quebec's sovereignty sentiment began during a period when English-owned and controlled smokestack industries dominated the Quebec economy. English speaking managers were generally abusive and authoritarian in their treatment of blue-collar French Canadian workers, who had little or no chance for advancement in most of those industries. The political ideal of an independent and sovereign Quebec proposed to offer dignity and respect to a French Canadian workforce that would have opportunities for promotion and advancement in their places of employment. While Quebec political strategists were formulating the ideology of life in an independent Quebec, a range of scientific and technological advances were occurring around the world. A pair of unknowns rewrote the Morse code of the telegraph industry by replacing the dots and dashes with ones and zeros to denote letters and numbers. The binary code became the language of very crude computing devices. During the early 1960s, a futurist named Alvin Toffler authored a treatise entitled Future Shock, in which he described how some of the evolving technologies were going to revolutionize the world of information processing, telecommunications, and automation in industry. A futurist named John Naisbitt published successive editions of Megatrends, in which he expanded on Toffler's work. Quebec's pro-independence political ideologues were perhaps far removed from changes occurring in the industrial world, but those revolutionary changes literally changed Quebec's industrial landscape. Smokestack industries faced the choice of either embracing the change or closing up shop. Technical advances created the kinds of job descriptions that pro-independence forces had hoped to offer in an independent Quebec. The arduous, backbreaking physical labour that prevailed in an earlier Quebec was being replaced by work that often required front line employees to make autonomous decisions and engage in independent thinking. Their initiative often directly contributed to the overall performance of an enterprise. Changes from outside of Canada, in other words, caused major changes in Quebec's industries. Neither pro-federal forces nor pro-independence forces can make any claim to having improved working conditions for Quebec's labour force. Still, Quebec's sovereignty movement intended to improve the dignity of the French Canadian worker in the workplace and that has mostly been achieved. The challenge for the pro-sovereignty movement of today is to provide an inspirational vision of life in a sovereign Quebec. The behaviour of federal agencies in such areas as energy and wheat drove the Western Independence movement in Alberta. A policy of greater laissez faire could remove the irritant that may otherwise have resulted in a western pro-sovereignty referendum. Free-market economists have repeatedly pointed out that while economic regulation and market controls may appear to have noble objectives, any short-term gains are sure to be followed by long-term pain. "Quebec's sovereignty movement intended to improve the dignity of the French Canadian worker in the workplace and that has mostly been achieved. The challenge for the pro-sovereignty movement of today is to provide an inspirational vision of life in a sovereign Quebec." Economic regulation has consistently failed over the long term, even causing the opposite of what policy makers had originally intended. Contemporary economic regulation allows senior bureaucrats to formulate regulations that may be signed into law by an Order-in-Council. That autonomy is backed by authoritarian governmental power, and may be a factor that sustains a pro-sovereignty sentiment in Quebec. Instead, the federal government should recognize the merit in curtailing federal economic regulations and repealing long-obsolete regulations. Economic regulation of telecommunications serves the dual purpose of fulfilling a political agenda in such areas as culture while shielding the commercial interests of some companies from legitimate competition. Advancing technology offers a wide range of possibilities as to how to transmit information. The combination of metallic water pipes and a metallic fence that separates multiple properties could be used to transit entertainment broadcasts within a neighbourhood. The copper water pipes, electric power lines, aluminum ducts and steel frames of high-rise buildings can be used to transmit telecommunications signals within one or more nearby apartment buildings. Respecting property rights would require federal telecommunications officials to observe a policy of laissez faire. Private, local broadcasters could then negotiate with appropriate local property owners to access the various conductors that exist within a neighbourhood and/or large buildings. Telecommunications is one of several federally regulated areas of the economy. Intercity transportation is another, with some economic regulatory powers being delegated to the provinces. Health Canada officials have proposed regulating vitamins, nutrients, herbs and supplements. 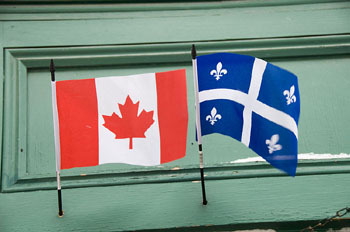 Members of Quebec's pro-sovereignty movement make a valid point when they state that the federal government has imposed too many restrictions on the lives of citizens. A policy that gives unelected bureaucrats the autonomy to produce a proliferation of new regulations literally has the potential to turn an entire population of peaceful people into criminals. Some members of the sovereignty movement believe that they may have a solution to remedy such a situation. The federal government, on the other hand, could expand on the initiative that began with the proposed abolition of the Wheat Board. Prevailing economic forces are leading governments to curtail spending, as is the case in Iceland, Ireland, Spain, Portugal, Greece and the UK. Governments are under pressure to restrict social assistance programs. The same economic forces would also restrict social assistance programs in an independent, sovereign Quebec where citizens might need to live very frugal and self-sufficient lives. However, the political ideologues may still be formulating strategies to address that situation.